The way to grab your listener's hearts is through their funny bones. Want to grab their attention? Do it with humour. Need to drive home a point they'll remember? Nothing does it better than a rib-tickling anecdote - like the ones in this book. 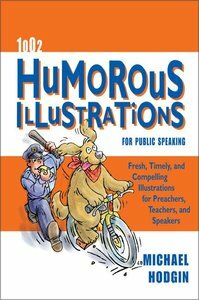 1,002 HUMOROUS ILLUSTRATIONS FOR PUBLIC SPEAKING is jam-packed with one liners, jokes, humorous stories and pithy proverbs for just about any subject or circumstance under the sun. Pick your topic. Appearances, Communication, Opportunity, Prayer, Self-Image, Sports. . . these and plenty more come to you conveniently alphabetised, numbered and indexed for instant referencing. There's even a space for you to log what you use, so fresh nuttiness doesn't become old chestnuts. Tested by preachers and public speakers, this ensemble of humour is just the ticket to get your audience laughing and listening. About "1002 Humorous Illustrations For Public Speaking"
Lasso Them With LaughterThe way to your listeners' hearts is through their funny bones. Want to grab their attention? Do it with humor. Need to drive home a point they'll remember? Nothing does it better than a rib-tickling anecdote---like the ones in this book. 1002 Humorous Illustrations for Public Speaking is jam-packed with one-liners, jokes, humorous stories, and pithy proverbs for just about any subject or circumstance under the sun. Pick your topic. Appearances, Communication, Opportunity, Prayer, Self-Image, Sports . . . these and plenty more come to you conveniently alphabetized, numbered, and indexed for instant referencing. There's even a space for you to log what you use, so fresh nuttiness doesn't become old chestnuts.Tested by preachers and public speakers, this ensemble of humor is just the ticket to get your audience laughing---and listening.